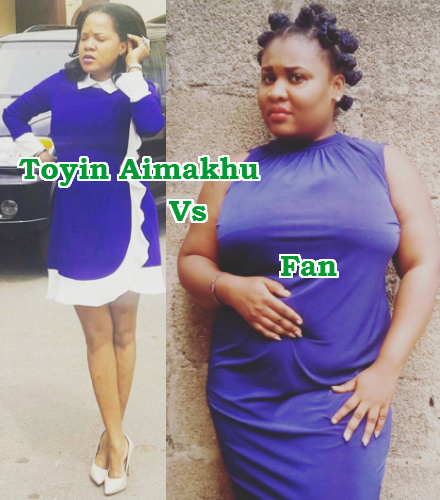 An undergraduate of the National Open University of Nigeria, Joy Akudo got more than what she bargained for after she allegedly bullied Nollywood actress Toyin Aimakhu. 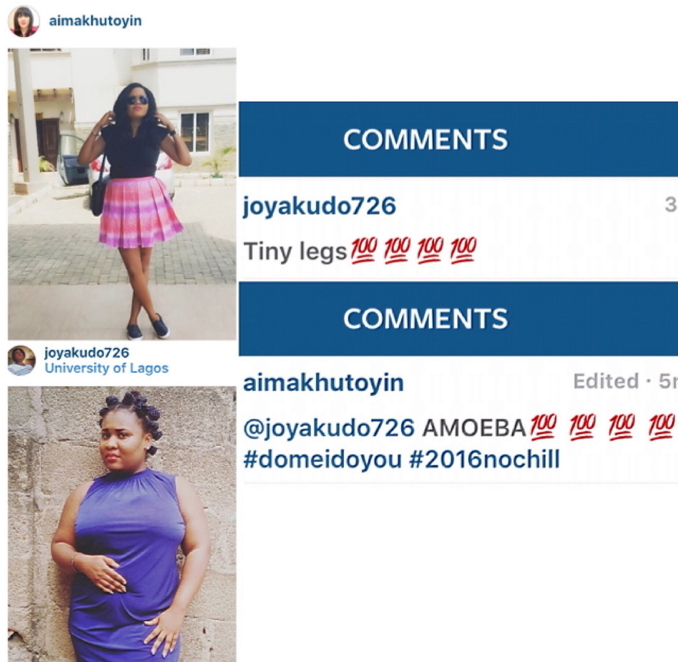 Joy had earlier posted the abusive comment below on Toyin Aimakhu’s photo. The actress immediately fired with her own “not so kind” word. Toyin Aimakhu has joined celebrities Julius Agwu, Ubi Franklin and Omotola who have declared 2016, a year of no non sense. Do to others as you would have them do to you Shinenah! Good answer to her too, why will she be calling her tiny legs, she did not created herself and beside before fe you abuse somebody take time to look at yourself very well. In as much I don’t like Toyin’ s characters but she’s human too, nobody want to take any sheet from anybody fan or no fan. 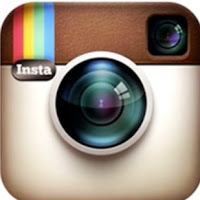 Hahahahahahahahaha, I love that Toyin, fans listen, if you do any how , you must see any how this is 2016!!!!!!!! SHE IS MADAM CHICKEN LEG, AND ONE OF HER FINGER SHOW THAT SHE IS USING BLEACHING CREAM. the fan ma self no get fine body, but na their wahala sha. @mrs Eranko I guess u re a woman nd not God wat can u build ? Can’t u see d name ? ERANKO, meaning ANIMAL . hmmmm,I now believe d adage which says “one man meat is another man poison”. I always admire everything about her,most especially her body structure nd d legs. Toyin Aimaku is wonderfully made from God. Lol..Omg!!! cant stop laughing, always check ursef before you start writing trash on people’s wall…she is truly an amoeba LMAO!!! PLZ LEAVE MY DEAR TOYIN AIMAKHU ALONE . SHE,S SPECIALLY AND WONDERFULLY MADE BY OLUWA !WHO IS DAT INSULTING MY NOLLYWOOD QUEEN AND DEFENDER ? THOW COME YOU NOTICED D TINY LEGS NOW THAT SHE,S PROGRESSING ? SINCE WEY SHE CARRY LOVE 4 HEAD , D LEG FULL 4 UR EYES KWO ??. 2016 IF U CURSE , TOYIN GO CURSE, IF U LAUGH,TOYIN GO LAUGH AND IF U DO , TOYIN GO DO ! JESU !